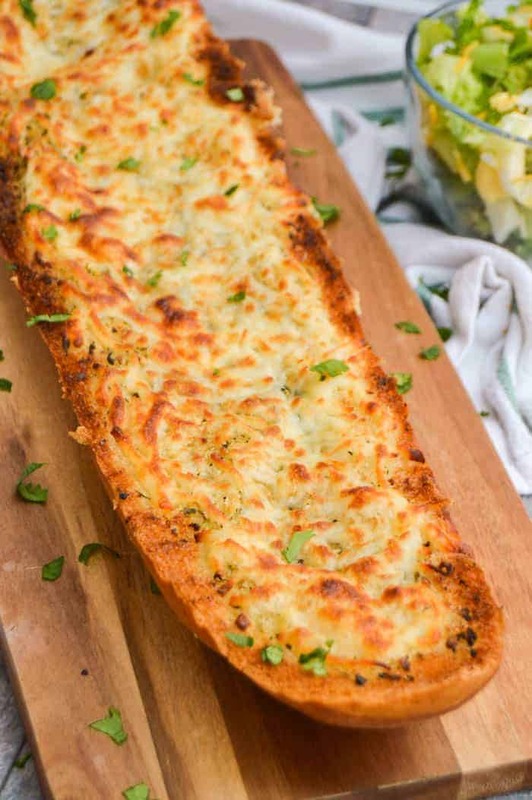 The best Easy Homemade Garlic Bread. 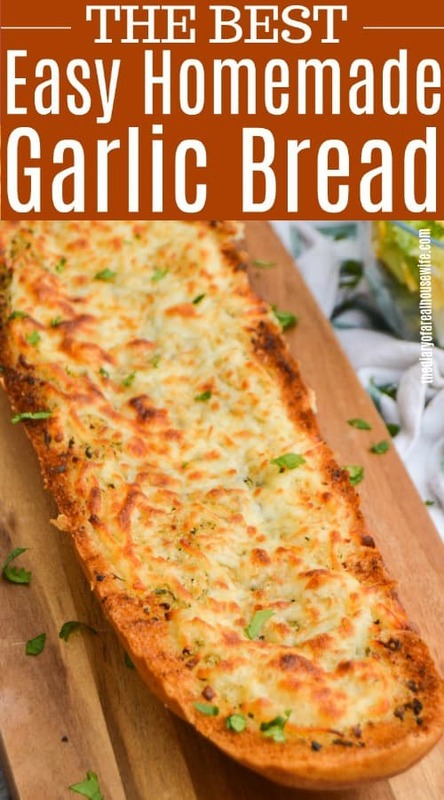 It’s made with garlic butter, seasoning, and topped with shredded mozzarella. It’s the perfect side to any Italian meal. Preheat and cut bread in half and place on a baking sheet then set aside. Melt butter, garlic, and Italian seasoning. Mix well then brush melted butter onto the bread. Turn off oven and turn on broil on high for 30-60 seconds until cheese is toasted and golden brown. I sliced each half into 5 pieces for 10 good servings. What herbs to use for Homemade Garlic Bread? For this recipe I used an Italian seasoning blend. Usually in Italian seasoning blend you will find oregano, marjoram, thyme, basil, rosemary, and sage. I topped mine with a fresh diced parsley for a garnish. I added shredded mozzarella to the top of my garlic bread. To give it a nice golden color I broiled in the oven for for 30-60 seconds. You can skip the cheese or change it for any cheese you like. I’ve had it with parmesan and cheddar and loved them all. Creamy Garlic Parmesan Penne: I love this simple pasta dish. The recipe works for just about any pasta but I love using penne with this one. Honey Garlic Chicken and Veggie Skillet: This was a favorite of mine. You can serve it on rice or skip the carbs and eat it as is, it was delicious! Baked Garlic Green Beans: These are so simple to make and so full of flavor. Pop them in the oven for a simple side dish. Preheat oven to 350 degrees. Cut bread in half and place on a baking sheet then set aside. Place butter, garlic, and Italian seasoning in a small microwave safe bowl. Microwave on high for 30-60 seconds until butter is melted. Mix well then brush melted butter onto the bread. 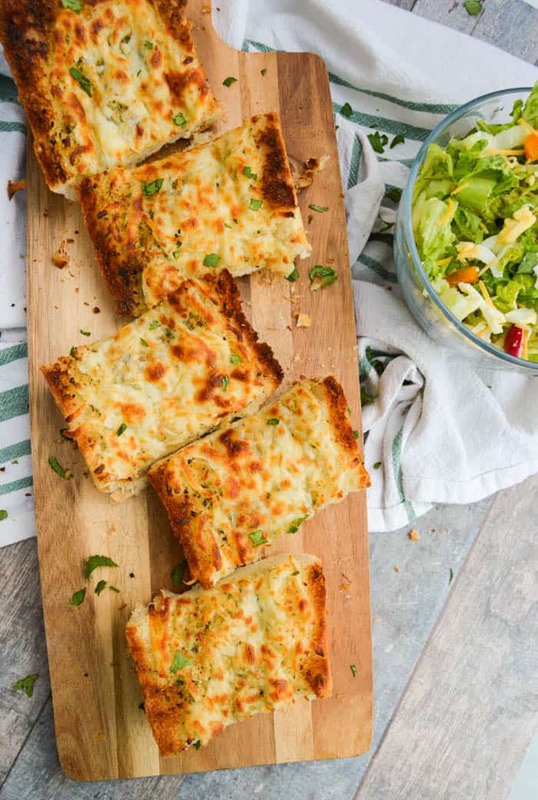 Top bread with mozzarella cheese and bake for 10-12 minutes until cheese has started to melt. Turn off oven and turn on broil on high for 30-60 seconds until cheese is toasted and golden brown. I sliced each loaf into 5 pieces and served. Optional: I garnished mine with fresh parsley.